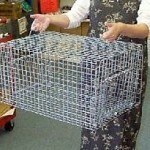 PIGEON 502R 12" X 16" X 28"
TRAP DESCRIPTION: 12" Wide x 16" Tall x 28" Long. Two one way doors on each side allow the birds to enter but not to exit. WHERE TO USE IT: Outside where the birds are a problem. Pre-bait for a few days to allow for a quick catch. Use in the yard, on the roof or in a parking lot. 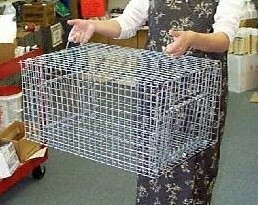 RATE OF APPLICATION: One trap can catch 10 – 25 birds. PIGEON 8" X 24" X 28"